Brand & Image Management CHI Durban October 2012. 4 3 © [year] [legal member firm name], registered with the trade register in [country] under number [number], is a subsidiary of KPMG Europe LLP and a member firm of the KPMG network of independent member firms affiliated with KPMG International Cooperative (‘KPMG International’), a Swiss entity. All rights reserved. Printed in [country]. 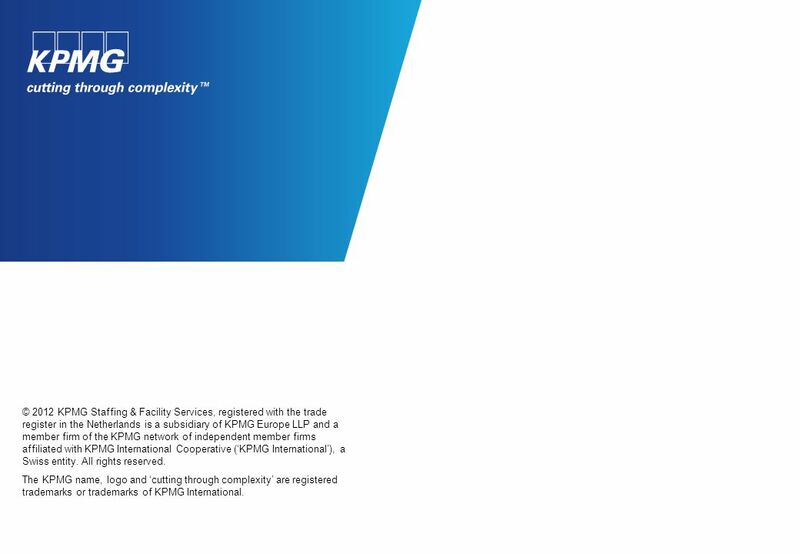 The KPMG name, logo and ‘cutting through complexity’ are registered trademarks of KPMG International. 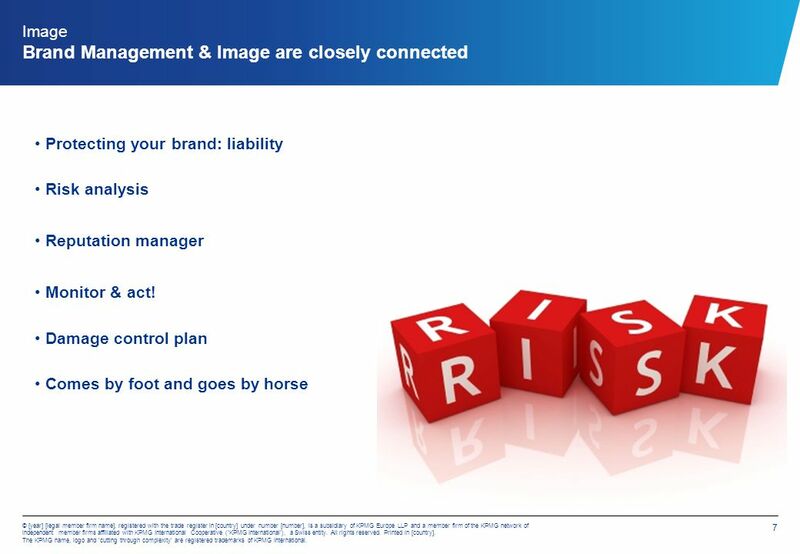 Brand Management Brand Management is not that simple; some questions What are the characteristics of a successful brand? 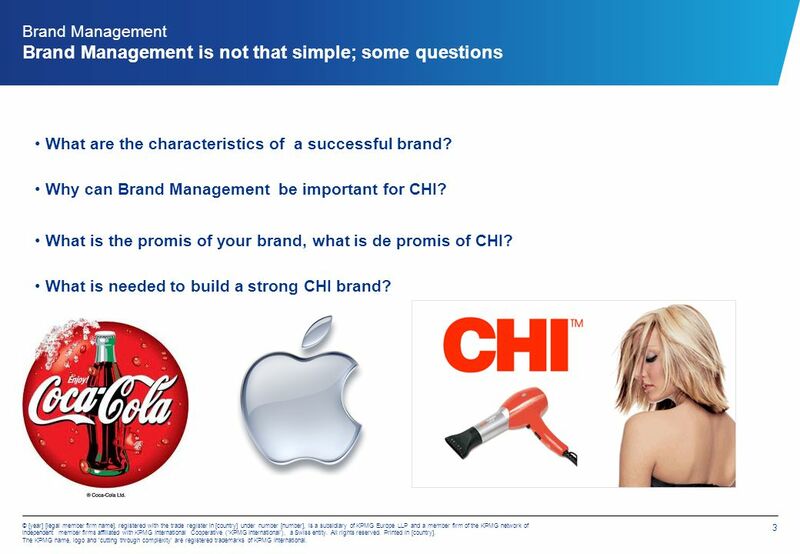 Why can Brand Management be important for CHI? 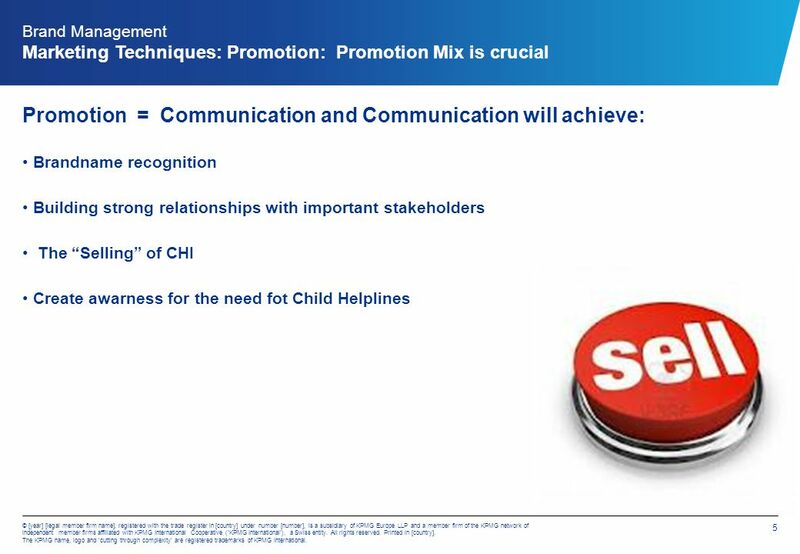 What is the promis of your brand, what is de promis of CHI? 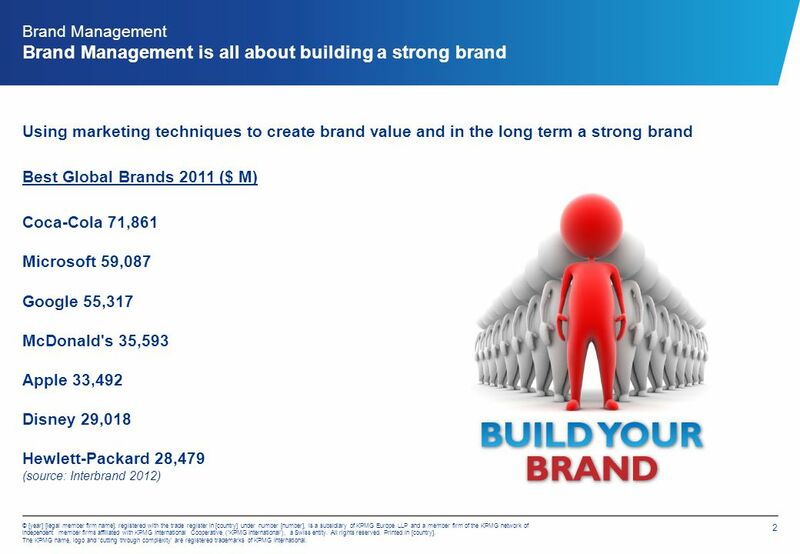 What is needed to build a strong CHI brand? 5 4 © [year] [legal member firm name], registered with the trade register in [country] under number [number], is a subsidiary of KPMG Europe LLP and a member firm of the KPMG network of independent member firms affiliated with KPMG International Cooperative (‘KPMG International’), a Swiss entity. All rights reserved. Printed in [country]. 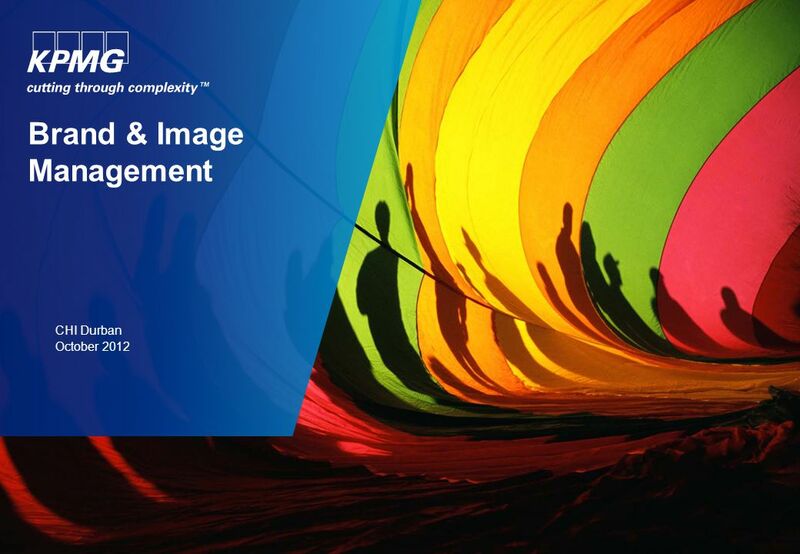 The KPMG name, logo and ‘cutting through complexity’ are registered trademarks of KPMG International. 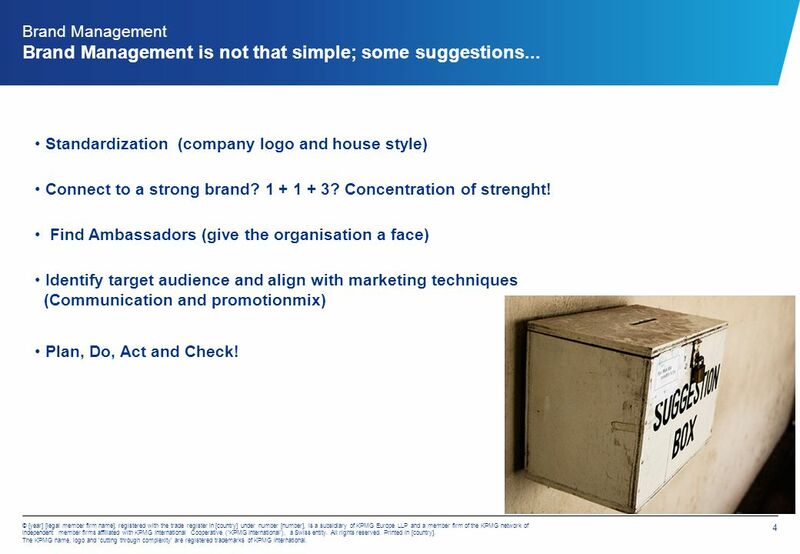 Brand Management Brand Management is not that simple; some suggestions... Standardization (company logo and house style) Connect to a strong brand? 1 + 1 + 3? Concentration of strenght! 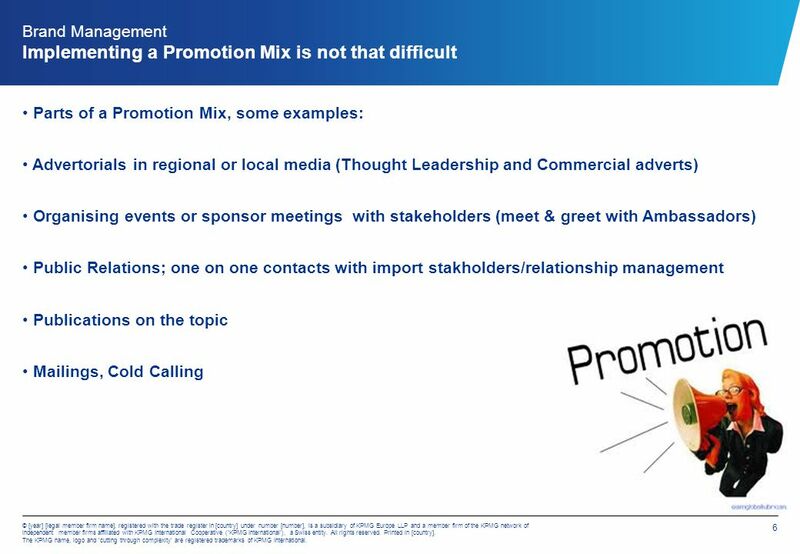 Find Ambassadors (give the organisation a face) Identify target audience and align with marketing techniques (Communication and promotionmix) Plan, Do, Act and Check! 9 © 2012 KPMG Staffing & Facility Services, registered with the trade register in the Netherlands is a subsidiary of KPMG Europe LLP and a member firm of the KPMG network of independent member firms affiliated with KPMG International Cooperative (‘KPMG International’), a Swiss entity. All rights reserved. The KPMG name, logo and ‘cutting through complexity’ are registered trademarks or trademarks of KPMG International. 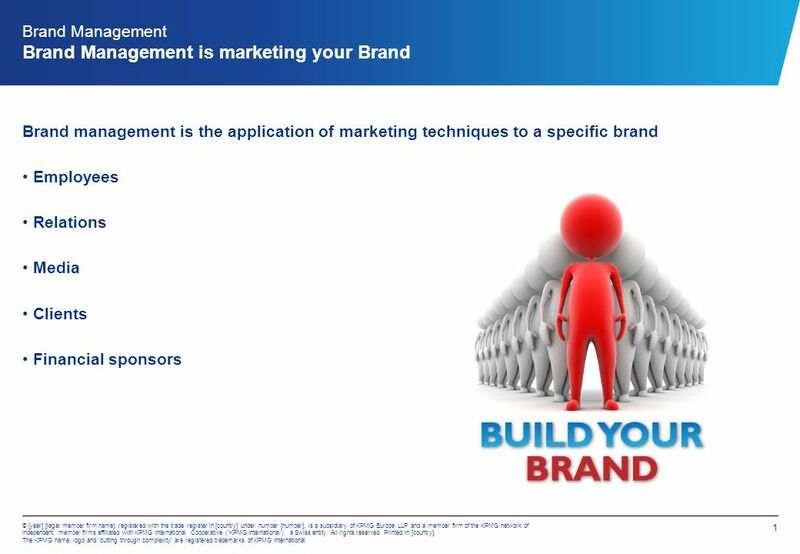 Download ppt "Brand & Image Management CHI Durban October 2012." Allan Yu Feb 23, 2011 IFRS Financial Statements Presentation. Driving change in information risk within the financial services industry Subtitle Date. Views on TRAC and the UWE workload model 12 th December 2013. Russia’s Hotel Projects and Investments Sven Osmers Head of KPMG’s Real Estate practice Russia & CIS April 10, 2014. College Efficiency Maximising Income John Bolt. © 2011 KPMG LLP, a UK limited Liability Partnership, is a subsidiary of KPMG Europe LLP and a member firm. Inaccurate Financial Statements - Prevention & Detection of Financial Crimes The role of the Audit Committee & Internal Auditors 17 February 2015. Governors’ Briefing Coleg Gwent, Ystrad Mynach College and University of Wales, Newport July 2010 Education ADVISORY. Trending Topics in Contract Auditing Presenters: Allen Devine, Senior Manager Dan Smith, Manager Government Contracts. Eurasian Economic Union – challenges and opportunities from customs perspective March 2015. 0 © 2009 KPMG LLP, a UK limited liability partnership, is a subsidiary of KPMG Europe LLP and a member firm of the KPMG network of independent member firms. How well is the Life Insurance Industry keeping pace with rapidly changing technology? International Insurance Society 23 June 2014 London. Public Private Partnerships: What’s in it for my Government? 14 July 2011 Malcolm Butterfield. Start-ups & big business Competition or competitive advantage? Imperial Business Insights Lecture 13 February 2014. Institute of Operational Risk Breakout Session - Operational Risk Nirvana KPMG Giles Triffitt Peter Watson Peter Docherty 1 November 2013. RIBA / UK TI Conference ‘Working Internationally’ Getting Paid Martin Kelly, KPMG LLP Ruth Adams, KPMG LLP 23rd March 2012. KPMG’s Abilities in Motion Network USBLN Annual Conference October 2012 kpmg.com. The eDiscovery Experience © 2012 KPMG LLP, a Canadian limited liability partnership and a member firm of the KPMG network of independent member firms.